Capcom's Ghost Trick now has an online demo, so everyone can know what it's like to possess a bicycle horn. Ghost Trick: Phantom Detective is one of the more unique games coming out on the DS next year, and rightfully so as it was developed by Capcom's Phoenix Wright crew. If you've heard of the game and want to know how it plays, now you can by checking out Ghost Trick's online demo put up by Nintendo. 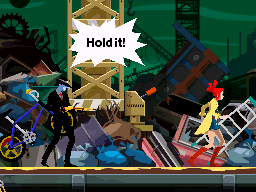 Ghost Trick is an adventure-puzzler that feels like a cross between Phoenix Wright and Professor Layton, but it also throws in a dark, noir-ish theme just for style. You play as a dead guy's spirit that is trying to find out why he was murdered and by whom. Luckily, spirits have all sorts of wonderful powers in Ghost Trick. The demo has players possessing various inanimate object in an attempt to save a girl that's about to be killed by a nearsighted assassin with a golden shotgun. Once you're in an object, you can perform a "trick." When you're in a guitar, this means you strum a few bars. When you're in a ladder, you can unfold it to move across the level. Through these sorts of possessions, you have to try to change the fate of various people such as this girl that are going to be killed, just like you were. When inhabiting a dead body, spirits can thankfully rewind time to four minutes before the body died, which allows you to save people that have already been killed. Once you save the girl, the demo is over. The demo, found here, is rather simple, but it gives you a good idea of how the game works and shows off its smooth animation and humorous dialog. The main character's hair might be a giant spike of obnoxious, but I think it'll be worth it to solve his murder anyway. Ghost Trick: Phantom Detective will be released for the Nintendo DS in North America on January 11, 2011.